In a further step towards the new wave of non-laptop based digital DJ performance, Pioneer DJ have unveiled the latest addition to their arsenal, the Pioneer XDJ-RX. Inspired by the top of the line NXS range, the XDJ-RX offers dual CDJ platters, a high performance professional mixer with a central full-colour display, pad based control and USB based recording and rekordbox integration. The single 7” LCD screen is the first of its kind on any Pioneer DJ product, allowing track information and browse/selection, dual waveform, playback position, BPM readings and beat grids for both sides to be visible simultaneously. 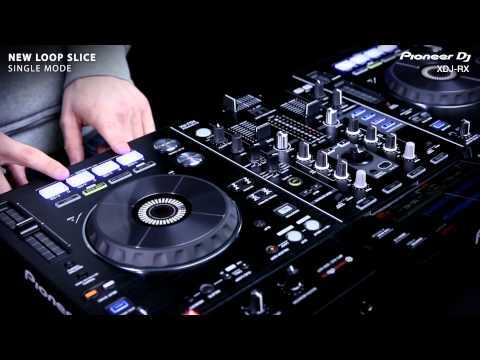 The CDJ platters use the standard club style layout and as usual offer hands-on access to the professional performance tools DJs using Pioneer products expect, including Beat Sync, Slip Mode plus quantised cues and loops. The addition of performance pads allows for tactile control of Hot Cues, Auto Beat Loops and sample selection and splicing with the performance orientated Loop Slice functionality. The mixer itself is without doubt a fully featured professional unit, featuring four Sound Clour FX, eight Beat FX, two MIC inputs, LAN port, two USB ports and host of other input and output options. Capable of being utilised as a stand-alone mixer and as a recording tool, capturing your performances and mixes using USB recording. The Pioneer XDJ-RX will be available mid to late February 2015 according to Pioneer, with a MSRP of £1199.